IMCORP is the leading provider of power cable reliability assessment services for medium and high voltage power cable systems of new cable installations and aged cable assets. We assess shielded power cable and accessories from 5kV to 500kV. In our more than 19 years in business, we have assessed over 140 million feet of cable systems across 4 continents. Our goal is to partner with our clients, achieve the maximum reliability attainable at the lowest total cost. Our assessment is non-destructive, requires no hazardous materials, and is a cost effective alternative to cable replacement. Our Factory Grade® technology produces results exceeding the cable manufacturers' quality standards. We identify the precise cable system Rehabilitation requirements, allowing the customer to Certify their cable systems to like new condition. This case study describes IMCORP’s findings during the dissection and root cause analysis of a substandard joint removed from a system feeding a critical facility. The IMCORP Factory Grade® technology targeted seven of fifty-one joints that had substandard partial discharge (PD) performance per the IEEE 404 standard. Due to cost saving measures, only the worst performing joints were repaired while others with substandard performance were left in service. 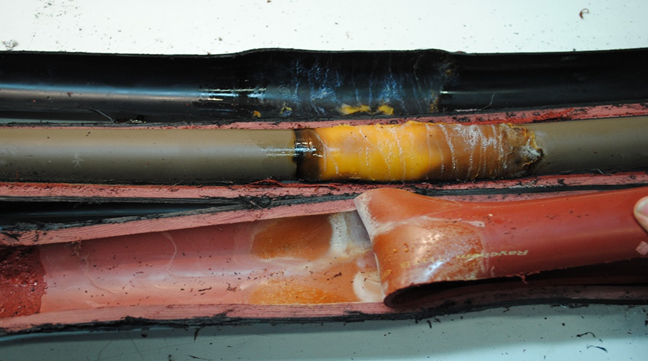 A dissection of the joints removed during repairs indicated multiple cases of an installation error associated with insufficient mastic surrounding the connector. A reassessment ten years later pinpointed significant degradation in one of the original substandard jointsThis case study describes IMCORP’s findings during the dissection and root cause analysis of a substandard joint removed from a system feeding a critical facility. The IMCORP Factory Grade® technology targeted seven of fifty-one joints that had substandard partial discharge (PD) performance per the IEEE 404 standard. Due to cost saving measures, only the worst performing joints were repaired while others with substandard performance were left in service. A dissection of the joints removed during repairs indicated multiple cases of an installation error associated with insufficient mastic surrounding the connector. A reassessment ten years later pinpointed significant degradation in one of the original substandard joints. A dissection and root cause analysis of this joint revealed the deterioration was due to the same connector area installation problem. Insufficient application of the void filling mastic left a sharp transition over the conductor connector which the inner black stress control layer could not follow. Where the tube did not follow the sudden contour, voids were left behind. Each subsequent layer showed evidence of voids where the material could not follow the contour. Significant voids and stress enhancements in the presence of high voltage stress leads to substandard PD performance, insulation erosion, and eventually causes the insulation system to fail short of the product’s design life. Fortunately, the owner of this critical facility used IMCORP’s Factory Grade® assessment to monitor and direct precise, proactive maintenance to ensure reliability.